Here's an interesting image. 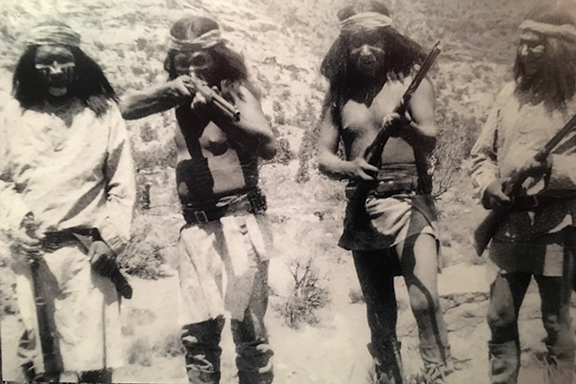 What appears to be an early photograph of Apache warriors, is actually young Kaibab Paiutes dressed up as Apaches. This was taken in the 1940s during a movie shoot. The irony is that the Paiutes were mortal enemies of the Apaches, but these young "braves" seem to be having a good time of it. Photo on display at the Pipe Spring National Monument Museum. And, by the way, the museum displays it as exactly what it is: a staged photo. I saw this photo after visiting Zion National Park last Wednesday and then traveling by Flex south into Arizona. 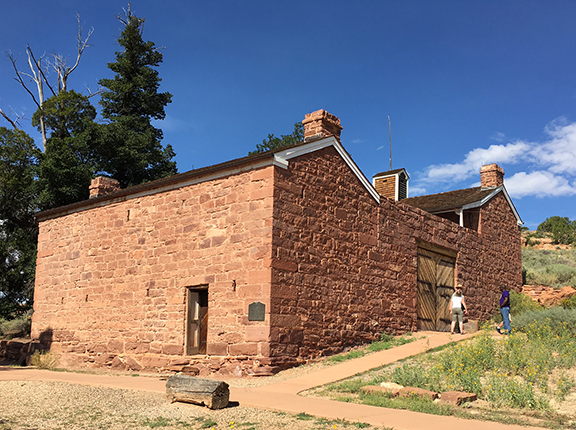 The museum is between Colorado City and Fredonia, in Arizona. All my life I have seen photographs of the Pipe Spring fortification and have wanted to visit it since it's in my home county, but due to weird state and county jerrymandering, the northern part of Mohave County is way-in-the-hell north of Lake Mead and the Grand Canyon and you really have to want to go there from Kingman (you can only access the area through Las Vegas and up into Utah and back down into Arizona, or, by traveling east to Flagstaff and then north to Page and into Kanab, Utah, and then drop down from there). This is the area where Warren Jeffs held sway at Colorado City (originally called Short Creek), with his polygamy empire, because it's so isolated and in no-man's-land. "We have opened a telegraph office here this morning—Miss Ella Stewart operator." —A.M. Musser, December 15, 1871. Ella Stewart is the future mother of the legendary Mo and Stewart Udall, prominent politicos in Arizona and on the national stage. Mo wrote a book, "Too Funny to Be President," and it was true at the time, although today, he might have to amend that title to "Intentionally Funny." "Lord, give us the wisdom to utter words that are gentle and tender, for tomorrow we may have to eat them."